A Daniel Island father brought a 7-year-old soccer game to a grinding halt this weekend when he demanded that his son’s shot on goal be reviewed on instant replay. Tim Dugan marched his Tevas right in the middle of the field, throwing a tantrum and ordering everything to stop until his son was credited with scoring a goal, even though it was abundantly clear the shot bounced off the goal post. Dugan demanded to speak with an official so the play could be reviewed in the replay booth. When he realized 7-year-old soccer games don’t have referees, he demanded that video footage from his wife’s iPhone be entered as evidence in the case. Dugan has a documented history of being overly-aggressive during Daniel Island sports leagues and yelling at people who don’t live up to his standard of athletic excellence. Dugan is expected to play in the men’s softball league this Sunday morning, where he’ll scream at his teammates for dropping fly balls and cry in his car after losing. 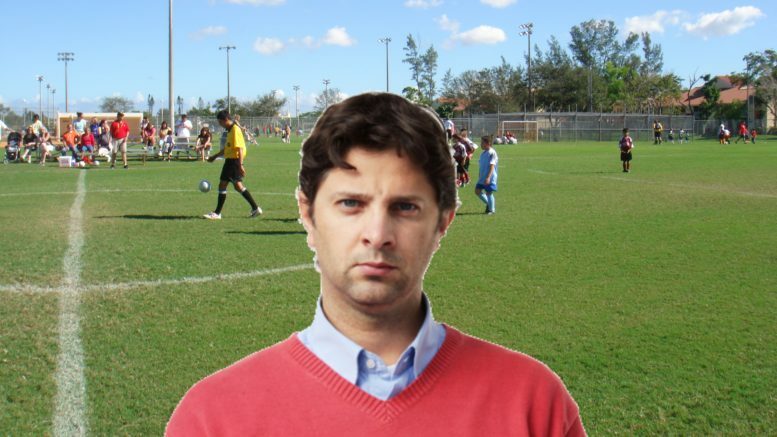 1 Comment on "Daniel Island Dad Demands Instant Replay Review at 7-Year-Old Son’s Soccer Game"